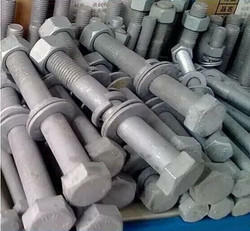 We are the sole manufacturer and wholeseller of 4.6, 8.8 & 10.9 GRADE HOT DIP GALVANIZED bolt, nut & washer(spring & plain) in Telangana & A.P. Matching up with the exact requirements of customers, we are involved in presenting wide array of Galvanized Bolt Nut Washer. We are one of the well-distinguished companies in the market that is into providing GI Nut.